A pocket calculator for the adepts (addicts?) of the Reverse Polish Notation... Do you remember? 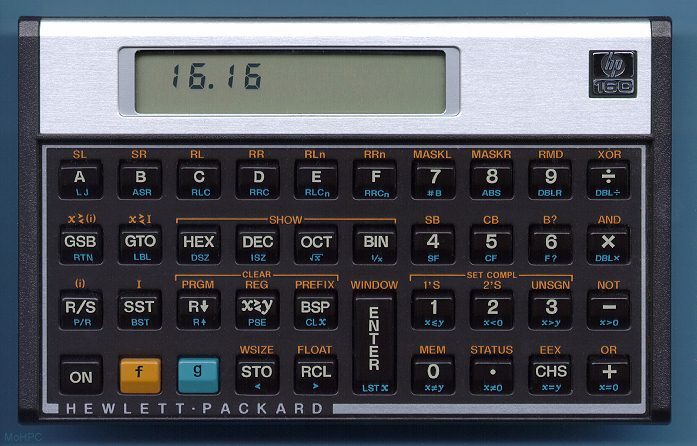 mine was a HP-16c. If you don't know what RPN is, you might want to take a look at the wikipedia entry for RPN. And if you don't like RPN, this site is definitely not for you. Your browser should allow this site to popup a window (if you want to have the calculator in a separate window). Your browser should allow for cookies (if you want your settings to be remembered across calls). This calculator works only with keyboard input (there are no buttons or menus in the gui). This is only a basic calculator, no fancy operations (maybe at a later date?). It is open source. Use it and modify it at your own will (but please keep a mention of the original author). The display shows a main register at the bottom and one or more stack locations above it. You enter numbers in the main register and push them on the stack using the enter key. The operators act on the value in the main register and the value in the first location of the stack. The main register changes to a lighter color when it is being edited. A digit or a '.' to input a number. Underscore '_' to change the sign of the value. Backspace to erase the rightmost character. Delete to erase the whole main register. Enter to accept the input of a number and push it on the stack. '+', '-', '*', '/' and '%' (percentage) for the basic operations. Up and Down arrows to push and pop values to and from the stack. PgUp (page up) to roll-up the main register value to the top of the stack. PgDn (page down) to swap the main register with the first location of the stack. F2 to restart editing the value in the main register. Right and Left arrows to change the number of decimals shown (0-6). Ctrl+Up and Ctrl+Down to change the number of stack registers displayed (0-9). Shift+Delete to erase the whole stack and the main register (reset). Provided that your browser allows for running RPN by LHG in a separate window, you can resize the window by grabbing its border with your mouse. The window dimensions and the number of decimals are saved in a cookie to be remembered for the next call. Copyright © 2010, Lionel H. Grillet, Zug, Switzerland.